This roomy GENUINE LEATHER Fanny Pack, can also be described as a true All-in-One Belt Bag. It also includes a GENUINE leather cell phone holder, and is as handy as something can get. It just does not get any more useful or functional than this! We all know what can happen in a crowded setting right, ESPECIALLY in Casinos! So now, you can leave your wallet or pocketbook at home, and you can use this leather Fannie Pack in Casinos instead of a money-belt which can be cumbersome and uncomfortable. 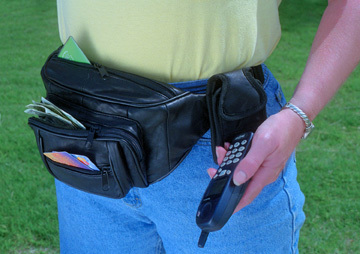 Instead, use this high quality and handy waist bag, to carry your money and or Casino Chips around. This carry all belt bag, with the exclusive Italian Brick design, has all the roomy functions of a standard belt bag, but with a twist. Our leather fannie pack also includes a detachable leather cell phone holder, that measures 4-1/2 x 2-1/2. Its like getting two high quality leather bags for the price of one. The waist strap is adjustable. These leather travel bags are also called fanny packs, fannie packs, and leather luggage. By Giovanni Navarre.